I clipped the first peonies from our garden the other day. The blossoms are much bigger than last year as I had just planted them last spring. This variety is called 'Shirley Temple'. I love the fluffy white softness of the white petals. I put the little bouquet on my night stand. When flowers are plentiful, I love bouquets on the night stand! They are beautiful! Our hydrangeas just started blooming and enjoying every minute of it!!! Thank you for sharing. 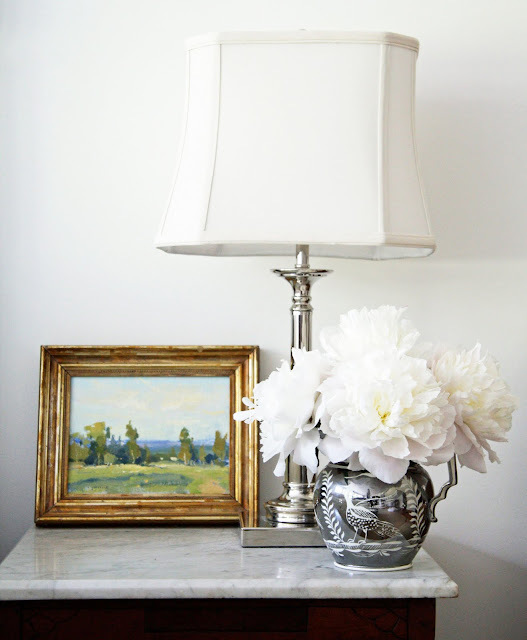 these are so beautiful - and i love your night table! They're stunning! Are they very fragrant? I love your home. Beautiful!! I have always loved peonies but have yet to grow them. Maybe next year! What a beautiful and unusual jug that the flowers are in too. I love it! I got our bedside lamps at Home Goods! Beautiful photo! Love your pitcher. I love peonies.. I wish ours were still blooming. Beautiful! I will have to look for that variety to add to ours next season! I LOVE the Peonies! I don't think I can grow them here in Charlotte NC :( I adore the painting on the table too!!! Beautiful Blog my dear! I must plant some peonies next Spring. They certainly look beautiful!! Our peonies have come and gone. It's so nice to see yours and Shirley Temple looks like a must have. 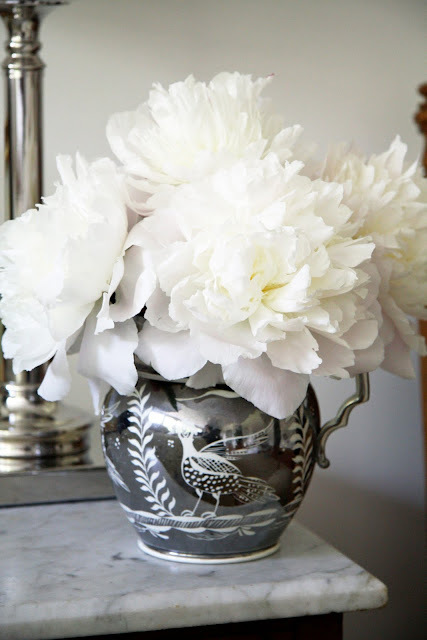 There are no better flowers than white peonies! pretty, pretty!! love the vase! OHhh I love Peonies! They are so beautiful and one of my favorite flowers. I would love to grow them some day in the meantime, thanks for sharing yours with me. Have a wonderful day! Hi there, Just found you and loved the Peonies-in fact hubby and I hope to get some for next year. I can't wait to read more of your posts, in fact I think I'll be following you. I am so nuts about your blog....wonderfully done! Peonies are one of my absolute favorite flowers, in part because their bloom period is so sweetly short and that makes me savor them all the more . . . .
Peonies are so gorgeous and this one is stunning!! Love it! I love your blog and I am new so any advice would be wonderful! Take care!! I have never seen peonies so white. All the white ones I have seen still have a pink tinge. I will definitely keep my eye out for these. 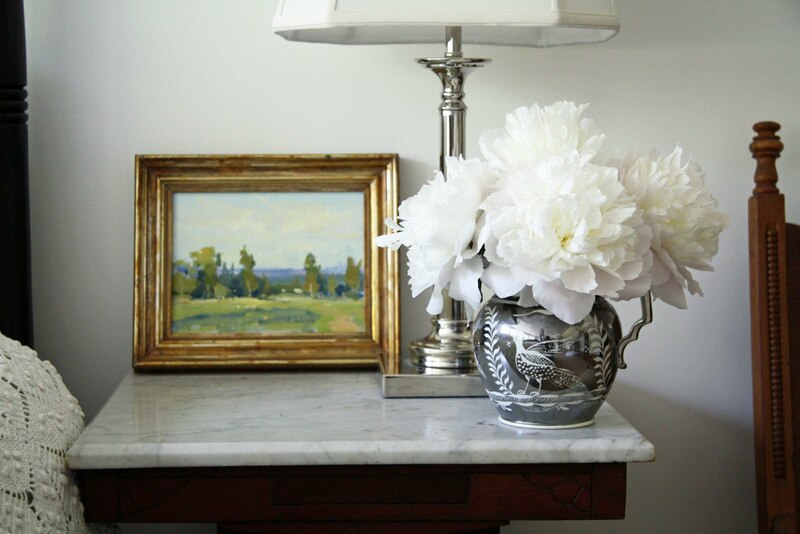 the peonies are so pretty and i love that little vase. So jealous, Peonies are my favorite. I live in the South where its just to hot for them to bloom. I LOVE peonies! I'm going to try them in my garden next year just for the pretty bouquets! Lovely! What beautiful photographs - have just discovered your blog. Lovely images - I'll be back. Best of luck with your twins - what wonders lie ahead of you.